Who are the Ethereum Cat Herders? 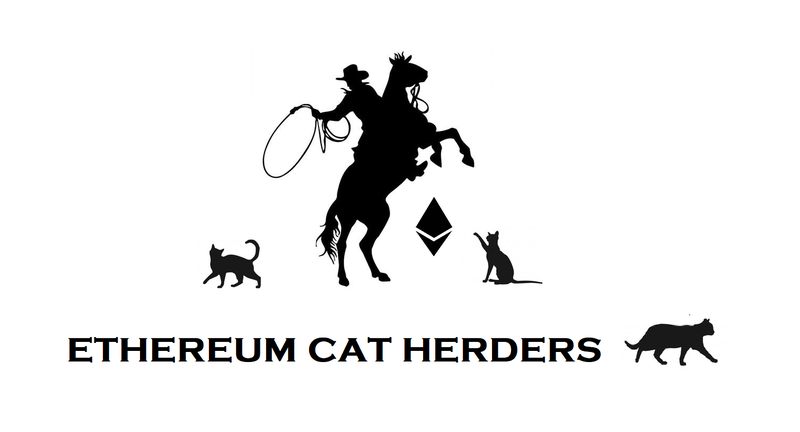 The Ethereum Cat Herders is a global, decentralized, grassroots community of Ethereans dedicated to improving the Ethereum protocol and community by improving underlying practices such as project management.This involves supporting Ethereum core developer teams by coordinating network upgrades, monitoring EIPs, creating PM processes and retroactive reports, relaying information among teams, taking notes during All Core Devs calls and much more. Why do we need the Cat Herders? Communication, coordination and facilitation are key components of any well-run project, including the best-run decentralised projects. When projects start there is generally a small group of individuals who know each other well, trust one another and talk to each other regularly. Formal project management and coordination is generally not an emphasis as communication and facilitation is pretty easy. As the project is so small, it’s easy for everyone to stay on the same page, moving in the same direction. As the Ethereum community has grown, more developers have started building on Ethereum and the project has quickly become larger than the Ethereum Foundation could manage on its own. This has led to community-driven initiatives outside of the Foundation, such as the Fellowship of Ethereum Magicians, EIP0 and the Ethereum Community Fund. We regard this process as natural and quite positive. The Ethereum project has also grown to include separate core development and research teams and processes. The development itself also split into separate initiatives, including Ethereum 1.x to improve the state of the current chain, and Ethereum 2.0 to move from Proof of Work to Proof of Stake and to add scale via sharding. And every day the project and community grow bigger and more complex. With this rapid growth has naturally come some teething issues, most of which can be addressed by better coordination and communication. In a large, global, decentralised project of nascent technology, this can be hard. Towards the end of 2018 a subset of the Ethereum Core Team, including Hudson, Lane, Piper and Jamie, realising the growing scope and complexity of the Ethereum project, decided to build a team focused on addressing some of the project management issues arising as part of the administration and coordination of project management across the decentralised Ethereum ecosystem. They reached out to the community and a small team of individuals from across the globe including Australia, Europe, Asia, and the Americas volunteered to help. That’s us. Unlike traditional project management, this team would not be the officially sanctioned ‘manager’ of anything. As part of the decentralized landscape, our purpose would be to coordinate disparate teams, becoming facilitators and enablers making life easier for the growing numbers of core developers and for the wider community at large. This would enable the Ethereum Project as a whole to keep a smooth pace forward. We decided to call ourselves the Ethereum Cat Herders, first and foremost because the name makes us smile, but also as a tribute to how hard it can be to coordinate independent parties in such a large project each of whom have their own goals and agendas. It’s also to poke fun at the idea that we are anything more than just a enthusiastic group of individuals who are here to help. What do the Ethereum Cat Herders do? What is the goal and desired impact of the Ethereum Cat Herders? The goal of the Ethereum Cat Herders is clear: to help facilitate and coordinate tasks required to achieve specific project outcomes within the Ethereum ecosystem and so assist with moving Ethereum forward. When unforeseen events occur, such as the last-minute postponement of a network upgrade, the Herders will be able to help facilitate and coordinate the required tasks to ensure sufficient consensus can be achieved to remedy the issue whilst also collecting the required data to plan for or ensure another such an event is mitigated in the future. What are the Ethereum Cat Herders working on? The Herders have started their new role in the community with a bang by facilitating the discussion and the ultimate decision to delay the Constantinople hard fork as well as coordinating and preparing the post mortem. We have also been tasked by the Ethereum Core Developers to coordinate the review and audit of ProgPoW. Implementing decentralised Project Management in the Ethereum Ecosystem, including tools and resources. You can find regular updates on projects and our progress at https://medium.com/ethereum-cat-herders. The Ethereum Cat Herders hope to become another essential pillar of support that helps drive the Ethereum ecosystem forward into the future through better, more formal project management. Jamie Pitts — Ethereum Cat Herder and hard working, deep thinking, full stack Etherean. All the Ethereum Cat Herders’ supporters for their generous contributions in kickstarting the Ethereum Cat Herders initiative by providing funding through the Gitcoin grant, with special thanks to Streamr for providing generous funding for note-taking for one year. One of the greatest benefits of getting involved with the Ethereum Cat Herders is that you are never in it alone! In that regard the author would like to especially thank Lane Rettig, Charles St Louis and William Schwab for their time and assistance in writing this article.